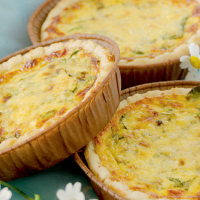 These easy tartlets are sure to be popular on a picnic. The fresh crab, hint of chilli and peppery watercress make a mouthwatering combination. Preheat the oven to 200°C, gas mark 6. Place a large baking tray in the oven while you make the fillings for the tartlets. In a large bowl, whisk together the eggs, cream, chilli and ¾ of the cheese, together with some cracked black pepper. Remove the pastry cases from the freezer (keep them in their paper cases) and divide the crab meat and chopped watercress evenly between the 6 cases. Place the cases on the preheated baking tray, then spoon the egg and cream mixture evenly between each one. Top with the remaining cheese and place in the oven for 15-20 minutes until just set and golden brown. Serve the tartlets with a simple salad using the remaining watercress and a drizzle of olive oil. If you prefer, use the quantities above to bake 1 large crab tart. Line a 23cm flan dish with 250g shortcrust pastry. Bake blind for 15 minutes then fill the tart case with the crab meat filling and cook for a further 20-25 minutes. The ready prepared tartlet cases are perfect for sweet dishes, too. For a fruit tart, simply bake blind, cool then fill with cream or crème pâtissière and top with fresh berries or fruit of your choice. The delicate flavours of these tartlets are suited to an aromatic dry white such as a Piedmont from Italy.